BOSTON–(BUSINESS WIRE)–The front door is a front-and-center opportunity for smart home device companies according to a report just released by Strategy Analytics. According to the report, “Smart Home Access Control: Predictions, Players, and Products”, sales of nearly 26 million units in 2023 will push the smart lock market size past $2.4 billion. Kwikset, Schlage, and Yale will control more than 75 percent of this market, but the looming threat of Amazon and Google entering the smart lock arena and consumer dynamics in Europe and Asia will complicate leading vendors’ longer-term initiatives. Additionally, as consumers’ purchases of smart door locks and garage door openers move away from early adopters and approach mass market status, companies competing in this market such as August, Chamberlain, Danalock, Kwikset, Schlage, and Yale must adapt to the changing dynamics of this segment. 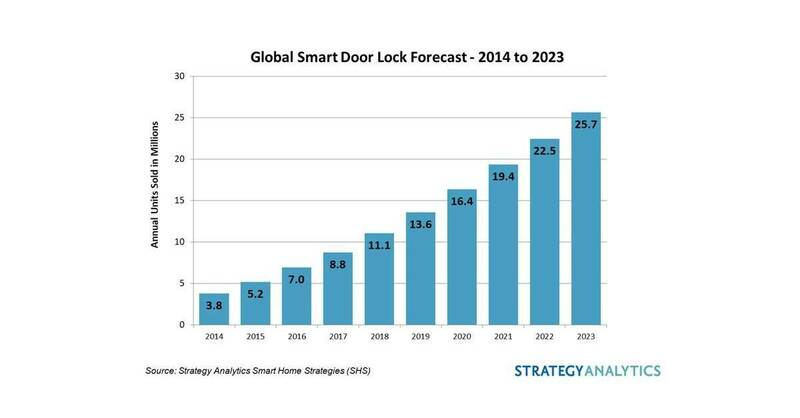 Annual unit sales of smart door locks will grow at 19% CAGR over the forecast period, but even as smart door lock shipments climb, lock manufacturers and their partners will need to assess how to overcome obstacles in markets outside the U.S.
A higher percentage of single family homes, and greater interest in smart home automation or security services, make the U.S. the largest market by far. Consumers in other regions have different priorities when it comes to the smart home.